Hello everybody, welcome to Grade 5RA’s art blog page. Our teacher is Miss A”Hearn. In our first post we will tell you about our country, Australia. Australia is a big island made up of 8 different states and territories. There are many different landmarks in Australia such as: The Great Barrier Reef, Uluru Rock (Ayers Rock) and the Sydney Harbour Bridge. We have many different ethnic backgrounds in Australia, such as: Italian, Greek, Vietnamese, Korean, Macedonian and many, many more. We live in the state of Victoria. In Victoria there are many different sports, but the biggest sports played in Victoria would have to be AFL (Australian Football League), Cricket and Soccer. In our opinion, Australia is a great country to live in. Hi everybody, have you ever heard of Captain Cook? Well he’s not as evil as Captain Hook and he’s not famous for cooking, but he did discover, our home, Australia. He had a special cottage from England that is now in the city of Melbourne in Fitzroy Gardens. It has a lovely garden with many various vegetables and flowers called Cooks’ Cottage. 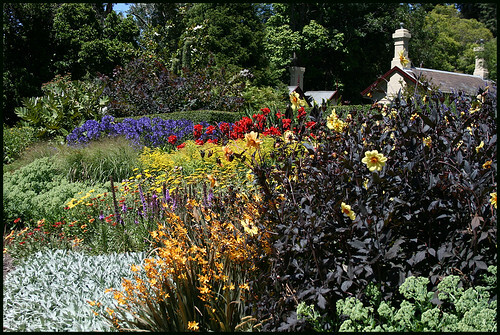 Also, another famous event in Australia, especially Melbourne, is the Melbourne International Flower and Garden Show. It features some of the most beautiful and breathtaking flowers. Last but not least, there are the Royal Botanic Gardens. It is a magical experience and a wonderful place to have a picnic. There are many types of beautiful flowers. Congratulations Adrian and Johnny on your great start to the 5/6RA class page. I was very impressed with how fast you type Adrian and how quickly you learnt how to create links. It was great that you had already written what you intended to say on paper and had even underlined the words you wanred to create links for. I hope that after some more practice you will soon be able to create a stand alone Class Blog for 5/6RA. Yey, Grade 5/6RA is awesome !!!!!!!! Great page! Hope you are enjoying school. Hello to all my friends still in TLPS and Mrs. A’Hearn and all my previous teachers! Hope you have fun in art this year! bring them in when I have art. Thank you for making the first steps towards making Blog comments. I like to believe that writing Blogs and making Blog comments will become writing Genres. I think that they are both “Writing with a purpose”. A great example of this is in Hannah’s Hacienda which is the Blog written by a Grade 3 student in California. Type it into Google. It’s worth a look, if not just for the jellybeans.You’ll see what I mean. Nice blogs guys and photos. Hi Grade 5/6RA. Comment soon. Sweet blog guys and thank you Mrs Osborn for inspiring me to write a blog about sports. It’s coming together slowly. Go to http://vickietoria20.edublogs.org for sports. I really like the bears, they are sooo cute.